We have an extensive range of BRIEFCASE HANDLES to suit every requirement with large stock levels for speedy despatch. Briefcase Handle. Chrome plated plastic with soft black plastic insert. 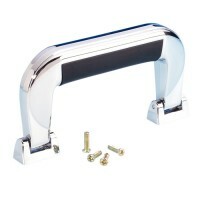 Chrome pl..
Briefcase Handle. Chrome plated plastic Chrome plated die-cast metal fittings. ..
Briefcase drop handle Black plastic with nickel coverplate Weight: 70 g Dis..
Briefcase Swivel Handle - (PACK OF 2) Material -CRS weight - 102G Dimensions ..
Briefcase Swivel Handle - (PACK OF 2) Black With Chrome Fittings weight ..
Briefcase Swivel Handle Black plastic with nickel With Nickel Fittings Weight: 39..
Curved Briefcase Swivel Handle - PACK OF 2 Black plastic weig..
Silver and Black Briefcase Swivel Handle ( PACK OF 2) Briefcase Swivel Handle 1 Bla.. Combination Handle or Foot Combination Handle/Foot enables case to be lifted f..